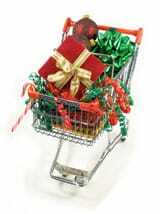 Can online shopping make holiday gift-buying easier? The Pro’s Answer: To put online shopping to the test, I decided to shop for my sister and husband’s holiday gifts using the Internet. My goal was to use searches, shopping websites and known sources to try and find my gifts online. The gist of this online shopping research came down to a very important factor for businesses: Put yourself in your customer’s shoes! My first purchase was for my sister. Having recently starred in “HAIR” at college, my sister was looking for music from the Vietnam era in which the play takes place. My goal was to find a CD compilation of artists from this era. I started my search at Amazon (http://www.amazon.com). At Amazon, I tried searching with phrases such as “vietnam protest music, 1960’s music, 1970’s music and hippie music” to locate a CD. Unfortunately, my keyword searches did not retrieve the type of CD I was looking for. I decided to click through categories of music to try and locate my CD. I clicked on “Classic Rock”, then “Psychedelic Rock”. This gave me a page of artist albums, like the Beatles and Jimi Hendrix, but no compilations. Spying a drop-down menu at the top of the page, I clicked on “Box Sets”, hoping to find CD’s with various artists. This brought me to a page of Amazon’s most popular box sets, but none in the Classic Rock category. I felt as though I was going in circles, not finding what I needed. Getting frustrated, I left the Amazon site. While searching at mega online shopping site Amazon, I was able to simultaneously search on other sites. I went to Froogle (http://www.froogle.com) and typed in “classic rock”. Froogle searches many stores online and pulls in results. The second choice Froogle gave me was a link to Best Buy, so I clicked there. I was taken to a page with “60’s Classic Rock Box Sets” on it, but there were no CD’s pictures or information at all! Again I found myself lost as I did on Amazon, clicking link after link, trying to find what I was looking for. Next I tried online shopping at Barnes and Noble online (http://www.bn.com). Many of the stores I’d shopped at offered suggestions. “If you like this CD, we also recommend…” Thinking I may get suggestions from the era, I typed in “HAIR”. I was given a page of Harry Connick Jr. and Shania Twain CD’s! Granted they have nice hair, but this was not the “HAIR” I was looking for! Being interested in music from the 1940’s and 50’s, much of my music collection includes CD’s from the Rhino records label. Thinking Rhino might have a compilation from this era, I visited Rhino Records at (http://www.rhino.com). I clicked through the categories “Folk > Compilations > Songs of Protest”. Finally! I instantly found a perfect CD for $11.98 containing the songs I was looking for. While at Rhino, I couldn’t help picking up a Johnny Cash CD for myself, thinking I deserved a treat after my shopping frustration. My total came to $27.95 with shipping. It took me about 15 minutes to shop and complete my online shopping order at the Rhino site. Overall I spent about three hours searching for the CD at various sites, but I don’t feel that I lost any more time than I would have browsing music stores for the same items. It was also nice to shop in my pajamas with a mug of apple cider! The next item I wanted to find was for my husband. He had seen a PBS television program host wearing blaze orange hat with a Green Bay Packers logo on it. I could tell when he saw it that this would be a perfect gift for him. Before I went to online shopping websites, I did a search in Google using several variations of “blaze orange green bay packers hat”. Unfortunately, I could not find any website with such a hat. I used several major shopping search engines, such as Shopping.com (http://www.shopping.com) and Bizrate (http://www.bizrate.com), but still could not find a hat. Even eBay (http://www.ebay.com) didn’t have one. I searched for at least two hours for the hat, with no luck. I posted a classified on theBubbler.com (http://www.thebubbler.com), thinking my fellow Wisconsinites might be able to help, but so far nobody has come forward with my hat! I have even called local stores, but the hat is nowhere to be found! I’ve heard that if you can’t find it on the Internet, it doesn’t exist… I think this may be true! My overall impression of online shopping is that it is definitely convenient. I was able to browse several stores at once, without travel or fighting crowds. I would much rather search on my computer than driving from store to store in winter weather. I think my searches would have been more productive if I’d had an exact CD title to search for. I found the shopping search websites very helpful for price comparisons. If I were looking for an item such as a kitchen appliance, I would recommend using these sites to see which store has the best price. From a marketing perspective, I believe that my tests further emphasize that website owners should put themselves in their buyers shoes. Is it easy to find products on your website? Is the navigation intuitive so that visitors don’t get lost? Is shipping information readily available? Do all products feature detailed information, including images and descriptions? I highly recommend that any website owner with e-commerce do a test purchase from their website. If you have trouble with your buying experience, so will your customers! Each month, “Ask the Pro” features a new article by our staff on internet, technology and computer related topics. So, we’d like to know– what would you like to ask the pro? From “Where do I find travel information on the web?” to “Where can I locate an ISP?” we welcome any and all questions for this section. If you have always wondered how to find genealogy information on the web, or how to select a digital camera, this is the place to ask! Just email your questions to askthepro@onyourmark.com. Previous Post Ask the Pro: How can I tell if a shopping website is secure? Next Post Ask The Pro: What should I look for in a digital camera?